A Kirkus Prize nominee and Stonewall Honor winner with 5 starred reviews! A New York Times bestseller! Named one of the best books of 2017 by NPR and the New York Public Library! A young bisexual British lord embarks on an unforgettable Grand Tour of Europe with his best friend/secret crush. An 18th-century romantic adventure for the modern age written by This Monstrous Thing author Mackenzi Lee—Simon vs. the Homo Sapiens Agenda meets the 1700s. 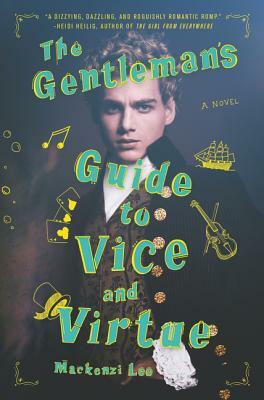 Witty, dazzling, and intriguing at every turn, The Gentleman's Guide to Vice and Virtue is an irresistible romp that explores the undeniably fine lines between friendship and love. Don't miss Felicity's adventures in The Lady's Guide to Petticoats and Piracy, the highly anticipated sequel! ★Mackenzi Lee (This Monstrous Thing) combines her knowledge of European history with a contemporary, comic sensibility to create an over-the-top romantic adventure complete with cliff-hanging chapter endings and sometimes outrageous narration. Monty is a licentious, flawed and engaging 18th-century hero. An elegant, colorful, swashbuckling good time of a read and a beautiful addition to the LGBTQ+ genre. This is a great novel for upper YA readers and a great adult cross-over title. I definitely have a book hangover after finishing this gem.